This week, we repeat our show on fabulous succulent designs! Yes, you know that succulents are thrifty on water. But have you thought about using your cuttings in floral arrangements? Well, here you go! This week, Trisha shows how to make enchanting indoor displays with cuttings that can be planted again to make more. And how about this idea for place card holders? How sweet of Trisha to make one for me! After misting the ghost plant for a few days, I planted it. Designing with succulents is new to many of us, but what fun we can have with them! Here’s a sweet idea at designer Rebecca Sweet’s garden in California. Closer to home, Eric Pedley from East Austin Succulents joins Tom this week to style up succulent design with upcycled containers. See how he turns any scavenge, from old toolboxes to even beer cans, into custom-made containers with a punch. With his eye for opportunity, even antique toys grab his imagination. His passion for succulents led to his nursery that’s just brimming with beautiful ideas. Give that trusty old wheelbarrow a second chance to help you out. And, do you know how this started out in life? This file cabinet is having lots more fun now. Eric shows how he drills unusual containers for drainage. And get his potting mix for healthy cacti and succulents. East Austin Succulents shares the land, across from Boggy Creek Farm, with Jon Hutson’s equally innovative nursery, Tillery Street Plant Company. In fact, I snagged these portulaca pictures there for Daphne’s Pick of the Week, ice plants. Many plants are called “ice plant,” including Delosperma and Aptenia. I covered a lot of low-water ground with just a few cuttings of Aptenia that Eric gave me at the Mayfield Park Trowel & Error symposium in 2012. You’ll also see them spilling out of Eric’s file cabinet and wheelbarrow above. Daphne’s question this week: how to shade plants as the summer heat bears down? Get her ideas for shading summer crops, new plants, or ones we have to move (even in April, when it’s hot as blazes). Here’s my down and dirty trick to protect a new plant for a few days to settle it in. As Daphne tells us, just angle your shading to allow light but protect from scorching sun. On tour, visit Bob Barth’s gardens and greenhouses. As co-founder of the Austin Cactus & Succulent Society. 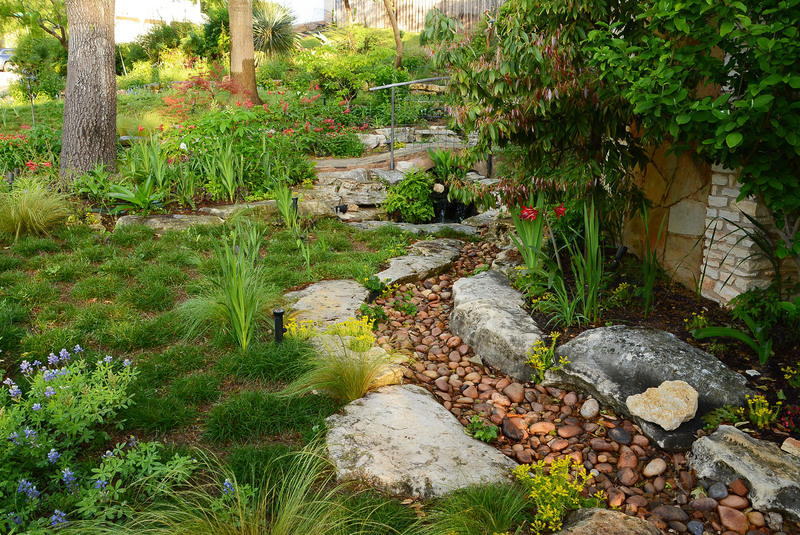 he helped change the face of Austin gardens with drought-tough plants. Over the years, he’s tutored me, along with so many gardeners, to escalate our perceptions about these drought tough plants in gardens. His passion led to the global community, where in greenhouses, he grows plants from the Old World and New, many endangered in their native habitats.These are astrophytums. He explains the defensive methods that succulents develop to protect themselves from heat, animals, and to collect water. Flowers attract pollinators. Echeverias need shade by afternoon and may not make it through super hot summers. They need protection from winter cold, too. But aren’t they lovely? From Bob, I’ve learned to NEVER touch a white echeveria! His story of lithops and how they propagate is one of his outstanding revelations. We’ve taped him before, but this time it’s in vivid HD. Here it is in his words with incredible video by Ed Fuentes and Jerin Crandell, assisted by Steve Maedl. Bob’s downsizing his extensive home nursery, Oracle Gorge, at his summer sale on August 3 from 10 a.m. – 5 p.m. and August 4 from 10 a.m. – 4 p.m. It’s at 602 Terrace Mountain Drive. And, mark the date for the Austin Cactus and Succulent Society Show & Sale Labor Day weekend. Now here’s a “succulent” picture for you from Jason Lantz, our Viewer Pic of the Week: luscious raspberries in his very edible garden!